Typhoon No 18 came through last night bringing lots of wind and rain. Even though it had moved on by this morning there was still a heavy rain alert out in southern Kyoto and school was canceled. I took a day off work to look after the boys and when the weather cleared up in the afternoon we went out to Joruriji. Joruriji is a small temple near to Nara. 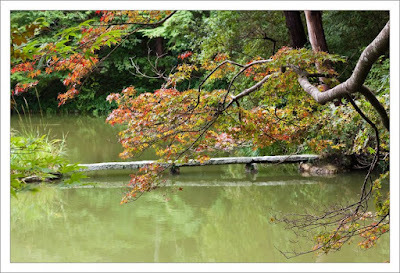 It is featured in a book I have on recommended places to photograph the autumn colours. 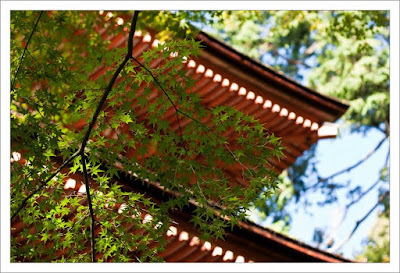 Although the leaves have not really started to turn yet I thought that this was a good opportunity to investigate and to plan a return visit in a few weeks when the momiji have turned red. The temple is only 20 minutes drive from home and is another one of the places which I did not know about despite being right on the doorstep. If nothing else, photography is leading me to find lots of interesting places nearby. The entrance to the temple is along a small path with farms on either side. 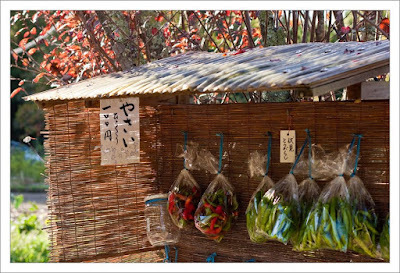 Just before the gate was a small stall with chillies for sale and an honesty box.Shown in the photo at the top of this article. The temple itself has a pagoda, shown above, and a hall next to a lake. Some of the trees have started to get some orange tinges but most of them are still green. 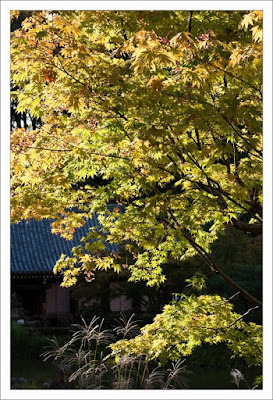 After photographing the pagoda I turned to see a tree backlit by the afternoon sun. This would have been better if there was more colour in the leaves, but I will have to wait for a future visit to try to capture that. Walking round the lake I tried to get a photograph of the bridge leading to the island in the lake. I did not manage a very interesting shot, apart from the bridge there was noting really of particular interest in the scene. There are several turtles in the lake but they were not cooperating today. 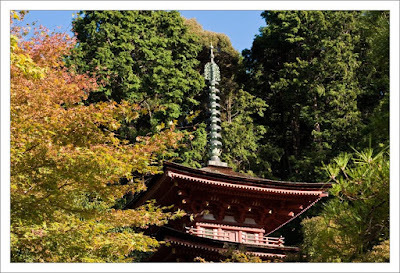 I finally took one more of the pagoda, with leaves in front of it. We did not have long as we had to get home for football practice, but I am looking forward to coming back here in the near future.